The Aunt Dinah quilt block can move a beginner quilter along the path to the intermediate stage. This block uses the same simple shapes, but care must be taken to assemble the block, due to mirror image pieces for some of the patches. Quarter square triangle pieces as well as half square triangles are used to create a patch known (in some circles) as the three-quarter square triangle patch. This is so named because it uses three triangles to make the final square though not all pieces are cut as quarter square triangles. Confusing maybe, but actually quite easy to make. I have chosen to make this a scrappy blue quilt, using a variety of blue fabrics. You could also use a variety of fabrics for the background as well. 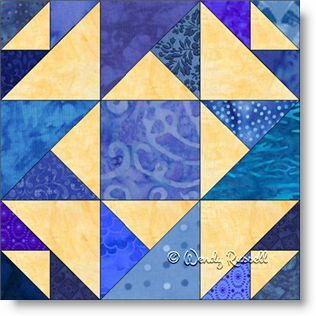 This quilt block would also look fabulous as a truly scrappy quilt, using many different colours -- as long as there is great contrast from the background fabric(s). The sample quilts illustrated give you suggestions for variations of layouts for your own personal quilt. You are only limited by your imagination.